The Dodgers were John Wayne and they looked into the eyes of the Dragon; Justin Verlander, and did what they said they would do. They forced game seven in Los Angeles. They are within nine innings of fulfilling destiny. Just when you started to feel the hands of time like sand through the hourglass, the magic at Chavez Ravine showed up. A little swirl of wind of the fall picked up, and the Dodgers stole it out from under the Houston Astros who led 1-0 on a George Springer home run. Justin Verlander was absolutely shoving. The Dodgers seemed to forget that the guy has been hit in his life; he is human just as they are. And then, the fog and haze in their eyes cleared. The Dodgers woke up. Austin Barnes lined a single. Chase Utley got hit in the foot by a pitch. Chris Taylor got one of the biggest hits in the history of the franchise, a double down the right-field line. Barnes scored and the game was tied 1-1. Corey Seager hit a ball that looked like it could have left the yard – it would have been on a hotter night – and although it was caught on the warning track the Dodgers led 2-1. Joc Pederson would homer to left field later to give the Dodgers a 3-1 lead that would be the final score. It won’t be talked about much, but Rich Hill has given the Dodgers two solid starts in this World Series. Dave Roberts started to manage this game like his short hair was on fire. And this time, it worked. He went Brandon Morrow, to Tony Watson, to Kenta Maeda, to bridge the gap all the way until the 8th and Kenley Jansen. Jansen was a lot sharper tonight, and didn’t even allow a threat. Jansen said Houston would need to beat all 25 of them prior to game, and it about held true. 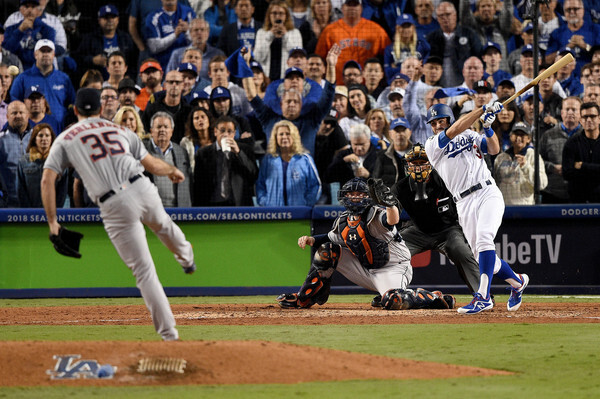 On Halloween night, the Dodgers got through Justin Verlander. They saved one last comeback for the final act, perhaps. They are close to fulfilling our vision we had back in June when we were in the magical city of Los Angeles. It certainly feels like they’re knocking on the door of destiny now. One more night to achieve eternity. One more chance to cement themselves as the greatest team ever. It’s been the greatest World Series ever. There is nothing left to see in this game for me after this game wraps up tomorrow night, truly. I feel like I’ve seen it all.